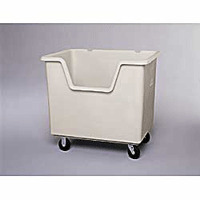 Durable polyethylene trucks are ideal for handling bulk products. Ergonomic design features sidewall cutouts for easy access to contents. Will not rust, dent or crack. Four 5" casters, (2) swivel, (2) rigid are attached to the 3/4" treated plywood base. SPECIFY COLOR: BL - Blue, GN - Green, LG - Light Gray. IN STOCK.